Hearty congrats to Sebastian Pozzo, Luis Salvatto and Lucas Esper Berthoud for winning Grand Prix Santiago 2018! THE HASHTAG FOR GRAND PRIX SANTIAGO IS #GPSANTIAGO. JOIN THE CONVERSATION. Aaaaanndd... it looks like we're done for the weekend! After sixteen rounds of Team Sealed and two Team Drafts, the field of 261 teams was reduced to just a single trio! Earmarked as one of the hottest teams, the trio of Sebastian Pozzo, Luis Salvatto, and Lucas Esper Berthoud lived up to expectations and methodically worked their way to the Top 4. There, they defeated the Bolivian team of Diego Roca Suárez, Marco Vargas, and Alejandro Van Mourik in the semifinals, before besting Willy Edel, Juliano Gennari Souza, and Thiago Saporito in the finals, claiming the three shiny silver cups for themselves. On the other side of the semifinal bracket was yet another powerhouse team of Guilherme Medeiros Merjam, Carlos Romão, and Paulo Vitor Damo da Rosa, creating one of the most stacked Top 4 in history! This victory was also significant for Salvatto, who followed up his win at Pro Tour Rivals of Ixalan with yet another smashing performance. 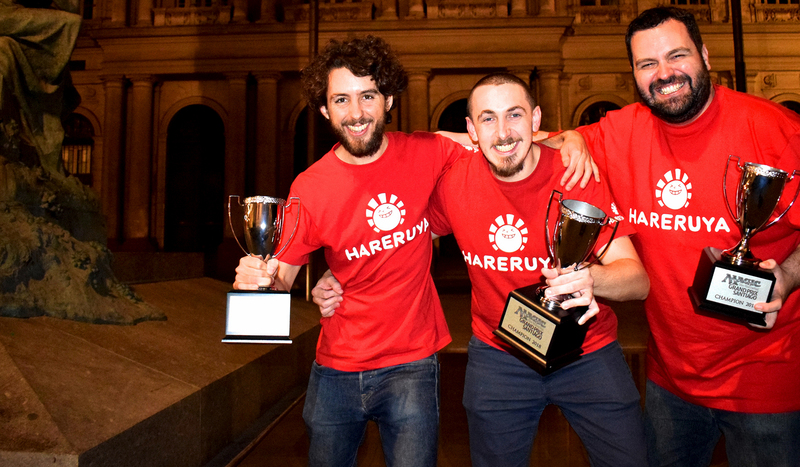 Once again, kudos to Sebastian Pozzo, Luis Salvatto and Lucas Esper Berthoud for winning Grand Prix Santiago 2018! After eight rounds of Team Sealed, the field of 262 teams was whittled away to just 40 teams of three! However, who was returning tomorrow at the top of the pack? Well, only one team achieved the perfect 8-0 record, and they were none other than Willy Edel, Juliano Souza, and Thiago Saporito! The three old friends stuck to each other, trudged on, and successfully entered Day 2 alone at the top of the standings. Close behind them were the six trios at 7-1 and four trios at 6-1-1, ready to overtake. Six more rounds of Sealed Deck tomorrow will determine the Top 4 teams and we promise we’ll have three Grand Prix Champions by dusk!